Se alt, hvad Rom har at tilbyde i to utrolige dage med denne spændende Super Saver-tur, der kombinerer fire top sightseeing oplevelser med en rabat på mere end 15%! Først op: Roms største højdepunkter, herunder Pantheon, Piazza Navona og Campo de 'Fiori om morgenen og derefter gå videre for at forkæle Capitoline Hill og Colosseum-turnéen. Traverse byen via komfortabel træner, se oplyste vidundere, såsom Vatikanet, om natten og derefter tilbringe dag 2 af turen på den fantastiske ø Capri. Begynd denne actionfyldte to-dages tur i Rom og Capri ved at blive hentet på dit hotel i centrum af Rom. Eller bare mød på et udpeget sted i byen. Efter at have mødt din guide skal du diskutere de forskellige møde- og afgangspunkter for eftermiddag og aftenture samt til den anden dag på turen i Capri. Forkæl dig i højdepunkterne i Rom på første del af Dag 1's guidede tur hele dagen. Start med at beundre Piazza della Repubblica med dens centrale springvand, Fontana della Naiadi, og så slentre gaderne i Centro Storico eller Historisk Centrum, og stop for at tage et billede foran den udsmykkede Trevifontænen (og glem ikke at kaste i en mønt eller to). Så er det videre til Pantheon, måske den bedst bevarede bygning i Rom fra oldtiden. Efter lidt tid at beundre det ydre og indvendige, gå over til Piazza Navona, det aflange formede firkant, der er foret med udendørs caféer og restauranter og centreret af en øjenfornemmende fontæne af Gian Lorenzo Bernini. Turen slutter kl. 13, hvor du får 90 minutters fritid. Mød op med guiden kl. 14.30 nær hovedbanegården, Termini, til den næste del af turen: Imperial Rome. Denne 3-timers guidede eftermiddagstur, via bus og fod, fører dig til hjertet og sjælen i det romerske imperium, på vej til Piazza Venezia for at se Capitoline Hill (og piazzaen designet af Michelangelo). Du kan ikke gå glip af Il Vittoriano, det massive faux-klassiske monument til Italiens Vittorio Emanuele II, den første konge i det nylige Italien. Gå over til nærliggende Church of St. Peter in Chains, en struktur, der holder kæderne, der engang holdt St. Peter i Jerusalem, samt nogle få skulpturer af renæssancemester Michelangelo. Afslut rundvisningen kl. 18.00 og tilbring de næste 90 minutter på din fritid før tredje fase af natten, om natten. Start den sidste del af turen på dag 1 ved at møde tæt på Termini kl 20. Hop på den komfortable træner, tag et hyggeligt sæde, og vær forberedt på at blive wowed af Rom oplyst om natten. Ride ved Forum Romanum, dets korintiske og ioniske kolonner tændes, og derefter krydser Colosseum, som er et syn at se om natten. Ride op langs Tiberfloden og se imponerende Castel Sant 'Angelo og selvfølgelig St. Peters Basilika med sin storslåede oplyste kuppel. Afslut turen ved at slippe afsted på dit hotel eller et andet punkt i centrum af Rom. Begynd den anden dag med turen med en afhentning på dit hotel eller vælg for at møde tæt på Termini Station. Efter at have rejst til det dynamiske Napoli, hop ombord på en vandski-båd til øen Capri. Når du er der, se de vigtigste højdepunkter på øen, herunder den strålende Blue Grotto (for egen regning) og nyd lidt tid til at udforske: forkæle en afslappende seafoodmad eller udforske Capri's største by. Når tiden kommer, begynder rejsen tilbage til Rom. This Rome Super Saver tour is a absolute must!!! We got the chance to see all the beautiful wonders in Rome.on the first day of our tour and then they take you on the bus to see Rome at night. Then the next day is a bus trip to Naples and a boat ride across the sea to Capri. The tour guild and bus drivers were so amazing and helpful and we did a tour and then had a wonderful lunch. Their were many different options to explore while there. The sea was too rough to see the Blue grotto, but you could take a boat ride around the beautiful island or take a gondola to the very top, or just stay where all the shops are and enjoy the outdoor cafe's. Were so glad we went. This 2 day tour was worth every penny, but I would suggest to be able to walk a lot and expect to be really tired at the end of the tour. Best ever!!! I'll be rating the four tours separately. Tour 1, rating 3/5. The walking tour was interesting. We got to see the Trevi fountain, Pantheon, Parliament buildings and Piazza Navana before travelling by bus to the Vatican. The guide was informative. What was disappointing was that the guide seemed to shut off after the Vatican in that she provided no information about any of the sights we passed on the way back to the office unless prompted. Tour 2, rating 4/5. We got to do a walking tour of the Forum, Capitoline Hill, San Pietro and the Colloseum. This was the highlight of the four tours. The guide was great. It would have been better if he had used the headsets so we could all hear what he said. The other thing that could be improved is that people get dropped off at their hotels on the way back to the office which adds about 50 minutes to the trip. It's really annoying. Tour 3, rating 0/5. This was a night tour of Rome. It was a rehash of the mornings tour although noe everything was dark. It was such a let down. At the end people got dropped off at their hotels which added 1 hour on to the tour. For those of us doing the 2 day tour this made the day really long. We didn't get back to the office until 11pm and we started the first tour at 8.30am. Tour 4, 1/5. We travelled to Capri. After getting back so late we were asked to be at the office at 7.30am to leave. We did not leave to 8.30am. No explanation given. Alot of the day is spent travelling in the bus. Unfortunately the guide was not very good. In the whole day I would say she spent 15 minutes giving us information. She was really poor. The food at the restaurant was really bad. One of my friends nearly broke a tooth on some hard seafood and the pasta was overcooked. It had rained so we couldn't see the Blue Grotto. The highlight was that in our spare time of 1 hour we went up on the chair lift and the views were great. We didn't get time to stop and eat on the way back. Don't do it...Green line tours are rude to deal with at the office, much of the day was an overlap of the previous morning or afternoon, The night tour was a waste of money as you can't really see anything because of glare and then they overlap from things that you see during the day. Capri trip was a complete waste, they held the bus for another tour, cutting our time down immensely, food was horrible, service not great...because of all of the delays we didn't have much time to see anything. 10 mins one stop and 30 mins another. They stop midway going to and coming from Capri. At both locations there were so many buses that the stores could not keep up with demand, so we were unable to get a coffee etc. We just had enough time to go to the washroom and even then we had to stand in line most of the time. Tour guide, barley gave us any information about the area we were in etc. Then at the end of the night they would not drop us near our hotel, plus the tour guide was actually rudely asking people for tips as they were leaving the bus. Three Rome City Tours were very good but only for the fit and active a lot of walking on the 2 day tours. The Capri tour was excellent and a good pace. Probably highlight of our Itallian trip. The night tour was disappointing! This package of tours is an excellent choice, and was overall, the highlight of our trip. The first tour compromises of an easy going walk through the old part of Rome, with stops at the Trevi Fountain, the Pantheon, and Piazza Navona. The tour guide provided a good amount of information, and it was easy to understand her. The group size was adequate. The second tour compromises of a Skip the Line tour of the Colosseum. However, prior to the Colosseum, the group is led to a small basilica just near the Colosseum. While this basilica is nice, I would have rather had more time to explore the Colosseum, and the area surrounding it. The tour inside the Colosseum was great, but a bit more time to explore the Colosseum area would have been nice. We decided to skip the third tour, the Rome Night Tour, as we were far too tired to even consider going on it, and due to the fact that it is necessary to wake up around 5 or 6AM in order to be well rested to go on the Capri Trip, which starts around 7:45AM. 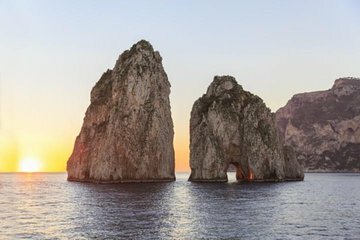 The Capri Trip was easily our favorite of this package. The Capri Trip was very well organized, and all tour guides were a pleasure to have due to their personality, being clear and easy to understand, and the amount of great information they provided. The boat ride to Capri is average, but in order to exit the boat more quickly, sit in the back of the boat the seats closest to where you enter the boat in Naples. Lunch is included on this tour, so it is better to avoid buying a large meal at the stop the bus makes around one hour into the trip, or anywhere in Capri in order to take advantage of this included lunch. One of the best parts of the Capri Trip was the chair lift ride 10 euros per person to the top of Anacapri. Once at the top, you are treated to an unbelievable view of the Gulf of Naples, and the Tyrrhenian Sea. While it would be great to have an extra hour to explore Capri, the bus brings you to your hotel past dark, between 9:15PM - 10:00PM.